Antoine Tesquier Tedeschi has used the living hinge to laser cut a clock, a pen holder and a coat rack out of birch wood board. The living hinge is a pattern that makes a stiff material like wood or acrylic bendable. 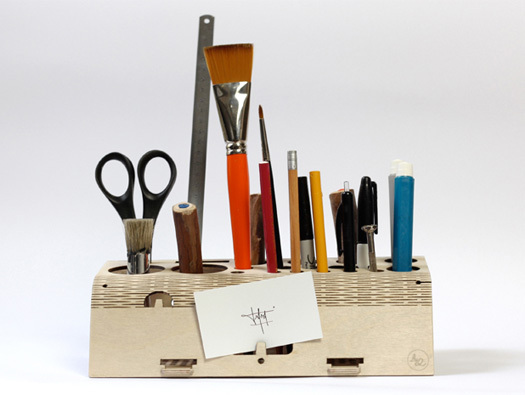 You can get all the supplies to create your own objects with the living hinge here. 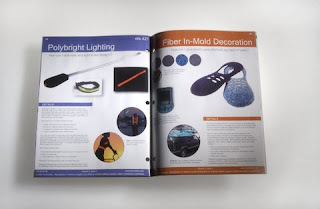 We are trying to decide if we should make a 12 page catalog for our customers. What do you think? Hyper Sea is hand crocheted with various types of yarn and low-current LED wire by artist and crater, Christa Pisto. This intricate landscape is composed of 16 free-handed pieces that took Pisto over five months to put together. It is currently being displayed at Redline Gallery in Denver, Colorado. Pisto told us, "I crochet all kinds of things like scarfs, afghans andAmigurumi. I just recently started free form pieces like the coral reef and I love it. I did not follow any patterns in this piece it is all free form. I love mixing the lights with the fiber and the ones I got worked so perfect I could not believe it!" Today I got to interview the New York based designer, Glen Liberman, the founder of Kinekt Design and Kinektron. Kinekt Design is behind the patented Gear Ring is made from high quality matte stainless steel. It features micro-precision gears that turn in unison when the outer rims are spun (as can be seen in the video). What is the name of your company and what do you do? Glen Liberman: I have two companies - Kinekt Design, which focuses on interactive jewelry and Kinektron, which focuses on electronic musical instruments. I also just launched a small online Shop as a side project, which features more of my personal design work. I'm the creative director of both companies, if I had to give myself a title. From a quick look a your site it looks like you've worked on some pretty cool projects. What projects are you most proud of? These wood wedges by Jill Sander are a great example of how laser cutting technology can be incorporated into high fashion. The shoe looks like a piece of nature washed ashore, driftwood topped with bubbles of seaweed. They are $1,240 at Jill Sander stores. Giles Deacon's horses around London Fashion Week S/S 2013Shattered glass in some form appeared on nearly every piece in the collection - it made the shape of artfully laser-cut detailing on white and leather dresses; as a graphic print on trousers, tops, skirts and trousers; as delicate jewels embroidered into bodices; and perhaps, most beautiful of all, as iridescent crystals encrusted into dresses - both short and floor-length - to create the illusion of a fractured pane, highlighting what looked like hundreds of shimmering shards. This awesome video is a glimpse into the future of laser cutting. Being able to free hand draw on the machine can really open laser cutter technology to artists and others who may not be familiar or comfortable drawing on the computer. 4 Products You Probably Didn't Know Were Laser Cut! Here are 4 projects that I bet you didn't know were laser cut or had laser cut parts. These great designs show how elegant and professional laser cut pieces can be. Inspired by Origami techniques from the past, a plain sheet of aluminum is laser cut, and then bend into the final product. Made up from only 3 different parts, this chair displays furniture design in its purest form. A powder coat finish is used to finalize the aesthetic and structural characteristics. The entire lamp is created exclusively from a 100 foot extension cord that has been wrapped around a laser-cut clear acrylic form. Coil Lamp is in the permanent collection of the Art Institute of Chicago, and is featured in "Rethinking Typologies" running March 3–July 29, 2012. Coil Lamp is available for purchase in two forms: Handmade & DIY Kit. Look! We were just awarded the FIRST Robotics Competition Gold Supplier Award! Hello! I've been working with Inventables to come out with a series of laser cutter projects to show how fab lab processes can be used to take a boring product that you might find at the store and crete a version with a bit of design. We invite you to join in our efforts in creating thoughtful and innovative products! The second project in this design series is the Buck Hook. The Buck Hook is made with with laser cut acrylicthat has been heat bent. Heat bending is a great way to add dimension to your laser cut designs. Thanks for checking this project out! Tell us what you think about what we're making with the materials in the Inventables store. More projects to come! Hi everyone! We feel there is a large volume of laser cut goods out there that fall flat, literally, in the 2D world. So, I've been working with Inventables to come out with a series of laser cutter projects to show how fab lab processes can produce high design. Digital fabrication has given designers the opportunity to create exactly what we want to design on the fly. As more of this technology becomes available for the home (like this desktop laser cutter and this Shapeoko CNC) the landscape of how we buy and sell products is changing. We ask you to join in our efforts in creating thoughtful and innovative designs! The first project in this design series is the Colony Coaster. The Colony Coasters are a set of tessellating cherry wood coasters that interlock to become trivets or center pieces. The honeycomb shape encourages users to work together to create new shapes over a cup of coffee or a glass of wine.